A lovely contemporary collection of glass towel rails and mirror towel warmers designed for central heating and electric systems. Our luxury glass towel radiators can be supplied in coloured glass including clear glass, white glass, red glass, cream glass, pink glass, red glass, purple glass and a zesty lime coloured glass. 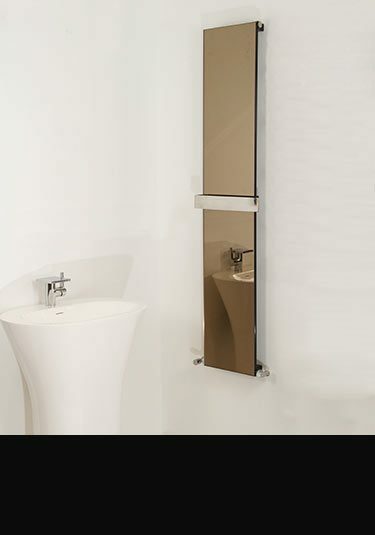 We also have mirror towel radiators with a silver or a contemporary bronze mirrored finish. All our heated glass and mirror towel rails are superb European quality, in the latest heating radiator styles and supplied with stainless steel towel hanging rails. A glass heating radiator with a towel hanging rail and large heat outputs. 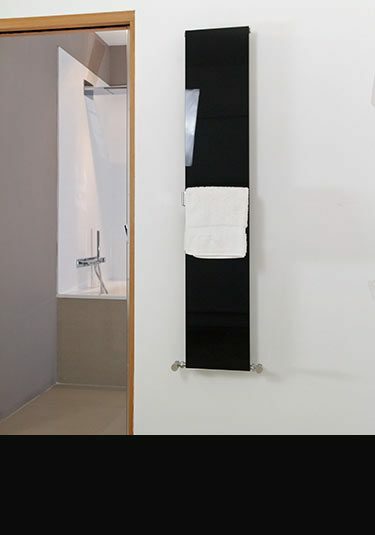 This designer towel warmer has a lovely polished aluminium surrounding frame and can be supplied in a black or white glass. 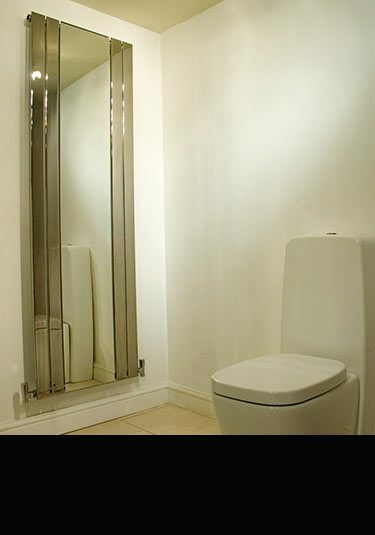 This central heated bathroom radiator has a mirrored glass finish and a stainless steel towel hanging rail. Our mirror towel rails can be supplied with a silver or bronze mirror. Designed and manufactured in Britain. This radiator with a long central mirror is ideal as a bathroom radiator because of its condensation steam free heated properties. Designed in Italy and European manufactured. A lovely quality bathroom towel radiator with a silver mirror and polished aluminium surround. 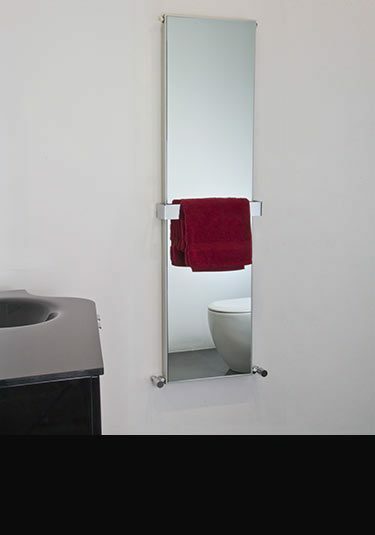 This mirrored towel warmer is supplied with a polished stainless steel hanging rail and is made in Britain for central heating systems. A lovely design feature for high quality bathrooms. A clear glass towel rail that has electrical heating elements invisibly woven into the glass radiator. Each glass radiator has high quality stainless steel wall brackets and towel hanging bar. Designed and manufactured in Germany. 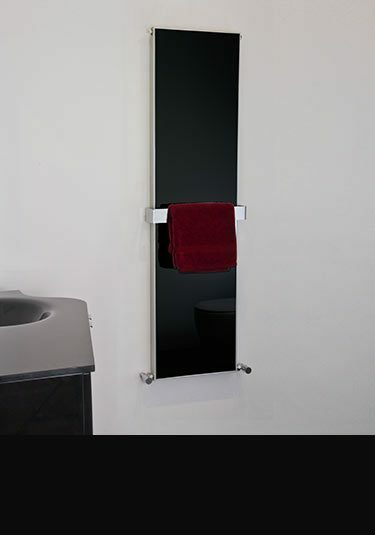 A slim glass towel warmer supplied with the choice of a white or black glass finish. Each bathroom radiator has a highly polished towel hanging rail which allows for the easy slipping on and off of the towels. British designed and luxury UK manufacture.